Seventy-five patients fulfilled the standard selection criteria for treatment of gallstones with piezoelectric lithotripsy. The ages of the patients ranged from 23 years to 73 years. Successful fragmentation could be observed in 74 patients (99%). The mean maximum fragment diameter after the first treatment session was 3.9 mm, measured 12 to 16 hours after lithotripsy. 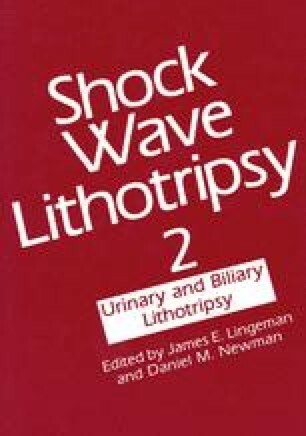 A median of 2,160 shock waves was applied at the first lithotripsy session, about 1,700 at the second, and about 1,500 at the third session. About 50% of patients received a second session; about 25% received a third treatment. No patient required any anesthesia, analgesia, or sedative before or during treatment; so, retreatments could be performed conveniently on an outpatient basis. Side effects were minimal. Microhematuria was observed in eight patients (11%); mild pancreatitis was seen in one patient (1%); increase of liver enzymes was noted in four patients (5.3%); increase of amylase without symptoms was found in four patients (5.3%); and biliary colic was observed in 24 patients (32%).